This year’s SCBO Family Conference and Annual meeting at Kalahari (Sandusky) featured a prayer room. Intercessors were encouraged to pray Tuesday for our national election and families. Wednesday was designated a day of prayer for REACH Ohio. Prayer banners, prayer cards, “How may I pray for you?” buttons and several other resources were provided for those who wanted to spend some time in prayer during the two day event. Prayer guides were available for a 40-day prayer initiative in the church. Mark Jones and the Northcoast Baptist Association provided hosts for the room. A copy of Developing a Powerful Praying Church by Richard Blackaby and Rick Fisher was available for those who wanted. If you would like resources to host a prayer room in your church, prayer walking materials, 40-days of Prayer Guides or a mission trip virtual prayer walk, please contact Steve Hopkins (SteveHopkins@scbo.org or 614.601.6820). 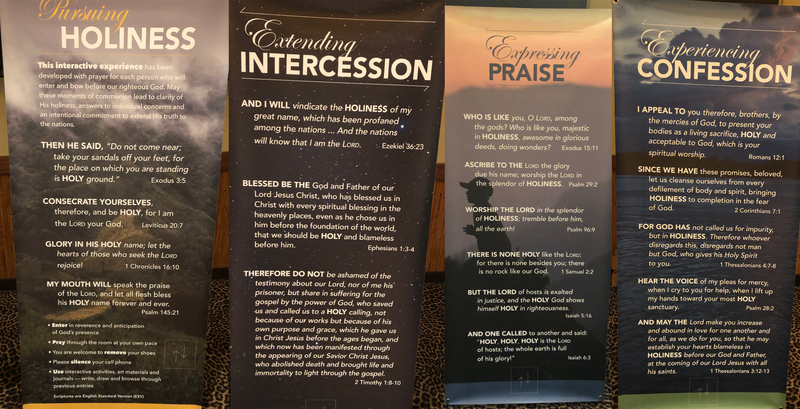 Prayer banners are available for loan, as well as prayer cards, prayer guides and other resources. Check out www.scbo.org/pray.